Lentil soup always seemed quite blah to me. Then I saw a recipe with lentils, red wine, and kale. I prefer spinach over kale so I decided to try it. It was so good! The hubs loved it and requested that I make it again. I knew this recipe would stay on my recipe-favs-list. The catch is this: hubs said don’t change anything. He knows me well – I do like coming up with twists to already-tried recipes. This one is so good, however, that it’s worth fixing over and over. I hope you enjoy it! A chunky soup perfect for clean eating. Heat 1 tsp oil in a large pot or skillet over medium heat. Add chicken sausages sliced and cook until brown, about 5 min. Set sausage aside in a separate bowl. Add 2 tsp oil and onion to the pot and cook until brown, about 5 min. Add garlic and other seasonings and cook, stirring for a min or two. Add water and wine, increase heat to high and bring to boil. Add lentils, reduce heat to maintain and cook on low for 40 min. Add spinach and salt and cook, covered, stirring occasionally until the lentils and spinach are tender, about 10 more min. Add the sausage and stir. Ready to eat! I love this recipe. 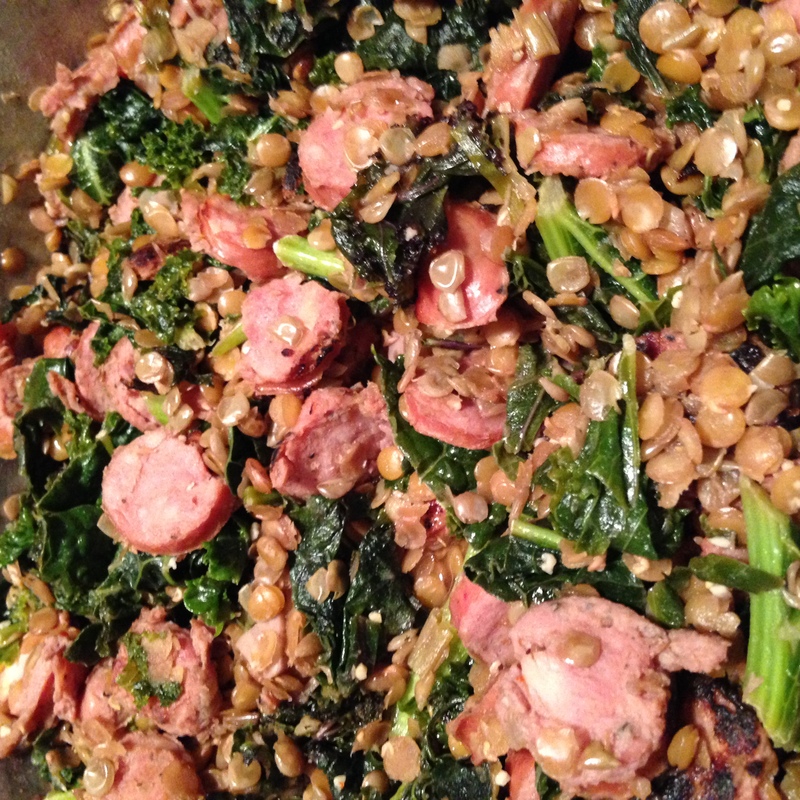 The combination of red wine and the chicken apple sausage with the lentils and greens are really delicious. Great recipe! Thank you, Patti! My daughter saw the original lentil recipe, and I adapted it using the chicken apple sausage and spinach instead of kale. I love it!